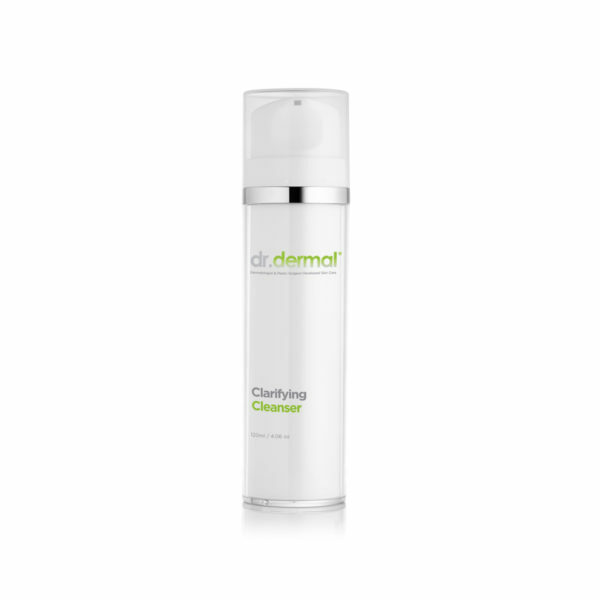 dr.dermal’s Clarifying Cleanser is perfect for combination or problem skin, or skin prone to frequent breakouts. Formulated with salicylic acid to decongest blocked pores and relieve inflammation, and glycolic acid to improve skin renewal it is effective and yet gentle. This cleanser contains naturally derived surfactants that will not strip the skin or damage the barrier. This cleanser contains salicylic acid which is a beta hydroxy acid (BHA) – this oil soluble acid penetrates the pore and dissolves the sebum blockages that give rise to acne. The natural surfactant is derived from coconuts making it sustainable and far more gentle on the skin than commonly used industrial surfactants like SLS / SLES. With 10% Lactic Acid and 2.5% Glycolic Acid it is also an effective anti aging exfoliating cleanser revealing smoother and more radiant skin. I am obsessed with this cleanser! It leaves my face tingly clean, but not tight. I have stopped using a face scrub and toner. It has cleared the stubborn congestion on my nose and chin. I’d highly recommend! Apply a small amount to damp skin and lather, taking care to avoid the sensitive eye area. Rinse off with warm water. Purified water, Sodium Lauroamphoacetate, Sodium Lauroyl Lactylate / Decyl Glucoside, Lactic Acid, Cocoamidopropyl Betaine, Glycolic Acid, Glyceryl Caprylate Caprate, Salicylic Acid, Potassium Hydroxide, Glycol Stearate, Titanium Dioxide, Sodium PCA, Phenoxyethanol, Ethylhexylglycerin, Lavendula angustifolia (Lavender) Flower Oil, Cedrus atlanticus (Atlas Cedar) Leaf Oil, Pelargonium graveolens (Geranium) Leaf Oil, Cirus paradisii (Grapefruit) Peel Oil, Citrus aurantium var.Amara (Petitgrain) Leaf Oil, Cananga odorata var.Genuana (Ylang Ylang) Flower Oil, Steam Distilled Citrus sinensis (Orange Blood) Peel Oil, Abies sibericus (Fir Silver) Needle Oil, Citrus deliciosa (Mandarin) Peel Oil, Cymbopogon martinii (Palma Rosa) Grass Oil, Anthenis nobilis (Chamomile Roman) Flower Oil, Matricaria recutita (Chamomile German) Oil. Q: Does this cleanser contain SLS? A: No, we only use naturally derived surfactants in our cleanser and it will cleanse and degrease without stripping your barrier. Q: Will this cleanser irritate sensitive skin? A: Since this is an active cleanser with a high concentration of Salicylic, Lactic and Glycolic acids, it may irritate sensitive skins. Q: Does this cleanser remove makeup? A: No it is a treatment cleanser and isn’t designed to remove makeup. We recommend using it once a day until tolerance develops, and thereafter twice a day. This product contains Alpha Hydroxy acid & Beta Hydroxy acid, and may increase sensitivity to UVA and UVB rays. Always use a sunscreen when using this product and for a week afterwards. For external use only. Do not use on broken skin. Keep away from eyes and mucosa. If contact occurs, rinse with water.